Similar to the previous Saturday, I got up at the leisurely time of 9am. By 10am I was once again at the local Subway, although this time I grabbed a foot-long Turkey and Ham and a Diet Coke to go. Shortly after 11am, I boarded a train at Town Hall station, got a seat and was soon eating my sandwich. 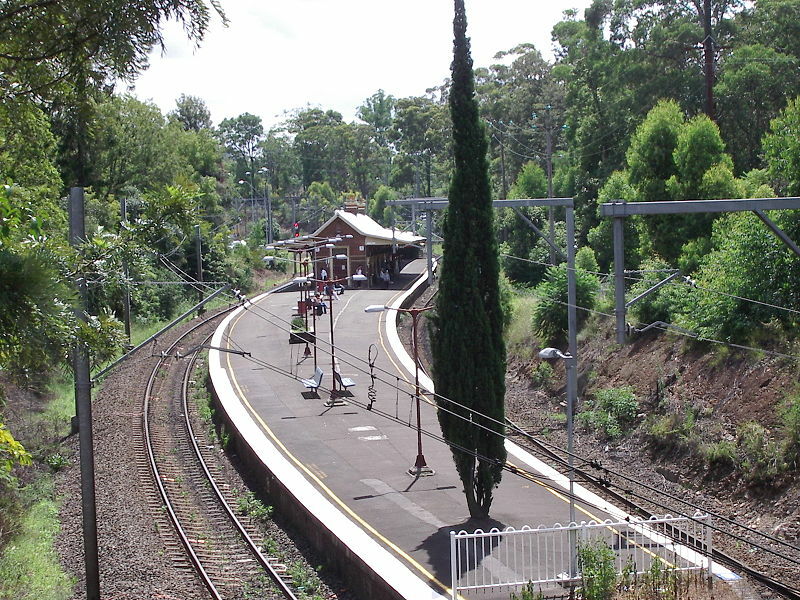 And just before noon I got off the train at Beecroft, about 22 kilometres north-west of the Sydney CBD. It was another glorious, if very hot, summer’s day. I threw my Subway wrapping and empty Diet Coke bottle into a bin, left the train station and began walking south-east back towards the city. 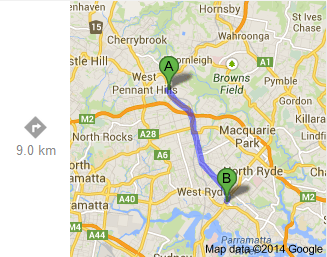 For most of my childhood, my late paternal grandparents lived in Beecroft. At least once a month my family would drive up from the Illawarra to see them, and we always went there for Christmas Day. Sometimes after seeing Nanny and Pa, we would drive from Beecroft to the Sydney inner-west suburb of Forest Lodge to see my late great-grandmother, as well as my great-aunt and my second cousin (both still alive and well, and now living in Queensland). Thus, the plan for today’s walk was to retrace that route by foot, or as much of it as I could. As well, I was inspired by something I had read back in 2005 about media personality Clive Robertson. At the time Robertson had been working mornings at ABC radio in Ultimo, not far from Forest Lodge, and after work he would spend 3-4 hours walking home back to Epping, not far from Beecroft. Originally, I had planned to do Robertson’s walk in reverse from Epping to Ultimo, but in the end I decided to start at Beecroft and finish, if possible, in Forest Lodge. 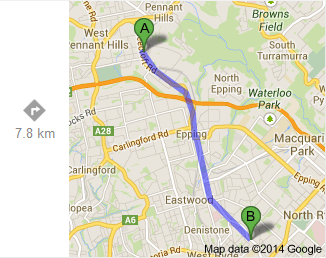 The first stage of my walk was from Beecroft to Epping, south-east along Beecroft Road. Most of it was pleasant and leafy older suburbia, and downhill. About thirty minutes later Beecroft Road crossed the broad expanse of the M2 Motorway and climbed uphill towards Epping. There was a mildly disruptive period where I had to cross the road because there was no pedestrian access on my side, and then cross back when there was the same lack of access on the other side, but after that was a very welcoming sight on the outskirts of downtown Epping. I grabbed a large Raspberry Slurpee from there, continued into downtown Epping past the railway station and crossed the bridge over the railway to my first stop. For fifteen minutes I relaxed at the corner of Blaxland and Epping Roads, and slurped my Slurpee. 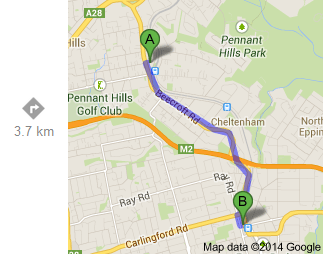 At 1pm I set off again, south along Blaxland Road. The first 5-10 minutes were pleasantly downhill. Then, as it began passing along the eastern edge of Eastwood, it climbed steadily uphill. Soon, Blaxland Road turned south-east, leveled out for a while and then went up and down for the next half-hour or so through more leafy older suburbia. About halfway through Denistone I saw another 7-11 ahead, but it was across the road and traffic was constant. I continued past the 7-11 a little longer until I saw a place that looked rather apt to sit near for another fifteen minutes and drink some of my water – a reservoir. At 2pm, I set off again. About 20 minutes later I was at downtown Ryde, and stunned by what I saw. The last time I’d been there many years ago, Top Ryde Shopping Square had been quite large. But it had now been replaced by Top Ryde City, which was enormous. So much so that I spent the next 10-15 minutes walking inside to find the Aldi there and get some more water. Alas, the Aldi was out of 1.5-litre bottles of water so I went to the nearby IGA instead. At 2:45pm I sat down outside the IGA and spent the next 15 minutes drinking one of my bottles empty. At 3pm, I set off again. I left Top Ryde City, found the last south-east length of Blaxland Road and followed it to the route that I would follow for most of the rest of my walk – Victoria Road, one of Sydney’s major thoroughfares. Fortunately, for the next two hours or so Victoria Road would be mostly downhill. Unfortunately, about half an hour later as I began passing through downtown Gladesville my legs were starting to hurt. Maybe it was because I’d spent the previous week back at work, sitting tensed behind a desk. Or maybe it was because the terrain of this walk had been harder than my previous two walks. Whatever the reason, I didn’t recall my legs starting to hurt this much this soon than during my harbourside walks. What was also disappointing was the landscape. I knew Victoria Road wasn’t one of the most picturesque places through Sydney, and downtown Gladesville wasn’t bad…but like a lot of other Sydney town centres I’d seen during the past decade or so, and especially like other town centres bisected by wide busy roads, it had its share of vacant offices and shopfronts and felt a little like somewhere you mostly drove through on the way to somewhere else, like a Westfield shopping centre (or Top Ryde City). As well, there was a place that made me stop, feel both happy and sad at once, and also try to take a photo of it (but I couldn’t because it was across the busy road and I’m camera-illiterate). It was a Volkswagen specialist, and crammed into its small front yard were about 10 old Beetles in various stages of disrepair. I was happy because old Beetles are always charming, and because they’re becoming increasingly rare it was good to see so many at once. I was sad, though, because they looked so forlorn. As I put away my unused iPhone I gave the Beetles one last look and hoped that one day they would be all be looking their best once more. Then I returned to my walk. 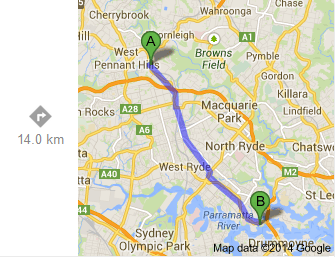 This time I walked for a full hour until 4pm, all the way through Gladesville. I could have crossed Victoria Road to Gladesville Reserve and rested under some shady trees, especially when I saw that my side of the road only had a bench with no cover at all from the blazing sun. But I thought What the hell – it was only going to be for 15 minutes, and I had been sweating like a hog for hours already anyway. So I sat on the bench, relaxed, drank and sweated some more. At 4:15pm, I set off again. And about 20-25 minutes later, for the first time during my walks thus far, I suddenly experienced something completely unexpected. And for a moment, it stopped me completely. This entry was posted in Action, Happiness, Inspiration, Life Challenges, Life is Good, Life Strategies, Travel. Bookmark the permalink.